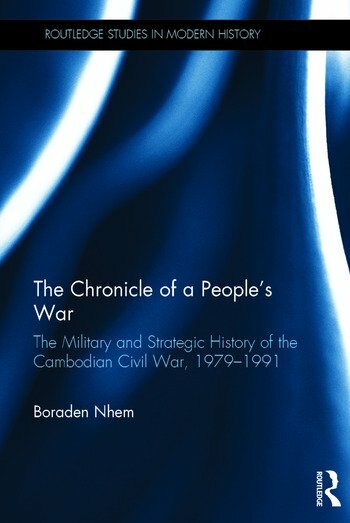 The Chronicle of a People's War: The Military and Strategic History of the Cambodian Civil War, 1979–1991 narrates the military and strategic history of the Cambodian Civil War, especially the People’s Republic of Kampuchea (PRK), from when it deposed the genocidal Khmer Rouge regime in 1979 until the political settlement in 1991. The PRK survived in the face of a fierce insurgency due to three factors: an appealing and reasonably well-implemented political program, extensive political indoctrination, and the use of a hybrid army. In this hybrid organization, the PRK relied on both its professional, conventional army, and the militia-like, "territorial army." This latter type was lightly equipped and most soldiers were not professional. Yet the militia made up for these weaknesses with its intimate knowledge of the local terrain and its political affinity with the local people. These two advantages are keys to victory in the context of counterinsurgency warfare. The narrative and critical analysis is driven by extensive interviews and primary source archives that have never been accessed before by any scholar, including interviews with former veterans (battalion commanders, brigade commanders, division commanders, commanders of provincial military commands, commanders of military regions, and deputy chiefs of staff), articles in the People’s Army from 1979 to 1991, battlefield footage, battlefield video reports, newsreel, propaganda video, and official publications of the Cambodian Institute of Military History. 2.5.3 Comrades at war: Vietnam’s southern march must be stopped! 5.5 Kampong Thom Province: "If I flee, where do you suggest I go?" Brigadier General Boraden Nhem currently serves as assistant to General Tea Banh, Deputy Prime Minister and Minister of National Defense of Cambodia. He previously served as Deputy Director of the Institute of Military History. He is also an adjunct lecturer at the Department of International Studies, Royal University of Phnom Penh. He received his PhD in Political Science and International Relations from the University of Delaware (United States) in 2014 after previous studies in Cambodia and France. He is a graduate of the US Army Command and General Staff College, class of 14–02, where he also graduated with an MMAS in Military History. He has authored a previous book, which examined the entire military history of the Khmer Rouge (1950s–1999).